This Vegan Hazelnut Macchiato is easy, dairy free recipe. 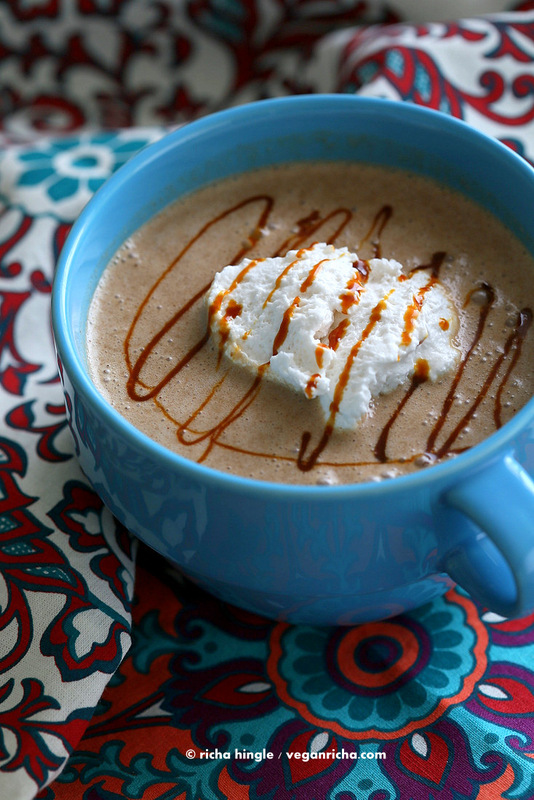 Make it frothy and hot topped with date hazelnut caramel or add ice to make Iced version. Soy-free. gluten free. This is a simple Hazelnut Macchiato recipe for the fall fix. Heat it up and serve or add ice and make the Iced version. The Dates make up the Caramel flavor, hazelnut butter adds the hazelnut, coffee, non dairy milk and lots of blending, makes one frothy drink! Adjust the nut butter, sweet, coffee to preference. Top with Whipped Coconut Cream and vegan caramel! What is your current favorite drink? Mmm. 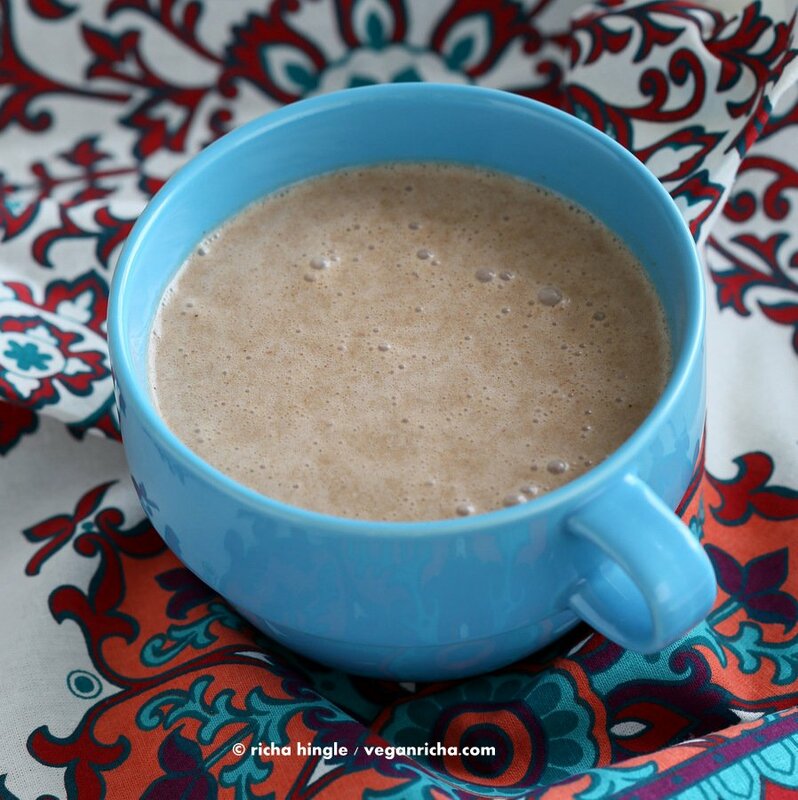 Make this warm hazelnut macchiato vegan and awesome! something that isn’t Pumpkin for fall! This Vegan Hazelnut Macchiato is easy, dairy free recipe. 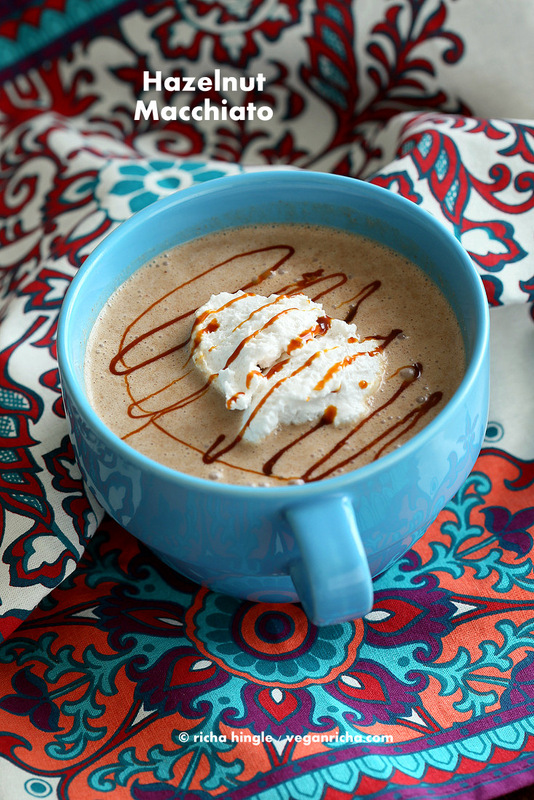 Make it frothy and hot topped with date hazelnut caramel or add ice to make Iced version. Soy-free. Dairy, egg, corn, soy, gluten free. In a blender, add the non dairy milk, pitted and soaked dates, hazelnut butter, coffee, vanilla and salt and blend until until smooth. blend a few cycles so the dates are incorporated well. Add 1 tsp cocoa powder if using plain nut butter. For a hot macchiato, heat up the blended mixture to desired temperature and serve. Top with whipped coconut cream and vegan caramel sauce. *If you don't like dates, add sweetener of choice and a Tbsp of vegan caramel. *For Caramel Macchiato: Omit the hazelnut butter. Add more coffee to taste. « Vegan Pumpkin Sage Pasta with Pumpkin Cream Sauce and Crispy Sage. what a perfectly cozy warm drink for the fall. looks spectacular. Wow. That looks so amazing, looks so rich and creamy, I’m definitely going to have to try it! This looks so delicious. A nice change from a mocha too! looks yum! loved the twist of adding dates..
Looks so delicious and the additions of dates is a wonderful idea, so rich and creamy. thoughts of adding a smidge (shot) of rum… YUM! either way, YUM!! I’m so happy fall is here – time for lovely warm beverages like this one! This sounds like a perfect drink for these cooler days! I am working on building a community of vegans and would love for you to hop over to http://www.wedigfood.com and leave a recipe or restaurant review. 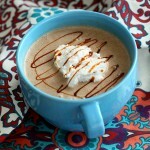 Thank you for sharing this Hazelnut Macchiato Vegan Recipe. serve using this best frothing pitcher I found on amazon http://www.amazon.com/Cafe-Luxe-Frothing-Espresso-Machines/dp/B00RM2JLW2/ref=sr_1_8?s=kitchen&ie=UTF8&qid=1442147875&sr=1-8&keywords=frothing+pitcher . I’ve been using this quite awhile and I recommend this for its durability and elegance.